I have a tendency to take pictures and then weeks…or even months later, remove the pictures from my camera. I mean it just takes way too long to get your pictures, right? Find USB cord, attach to camera, attach other end to computer, and turn camera on. Really hard. Remember back in the day before digital cameras, and we had to drop off our film? I mean seriously, it doesn’t take that much effort, yet I continuously take my time removing them from the camera. So my point to my little rant is that I found pictures I took of my scarf rack that I hung up in my room a few months ago. 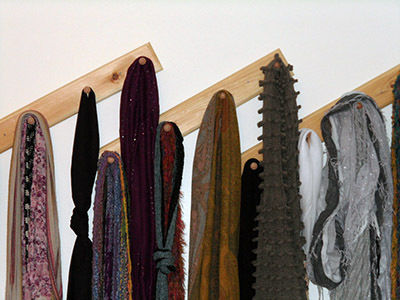 The great thing about this rack is that it’s sturdy to hold a ton of scarfs and it adds color to a wall that was once bare. I bought three wooden racks from Michael’s Craft Store, drilled holes in them and eye-balled about where they would go. I used a nail to mark the walls through the holes of the racks. I hammered the nails in a downward fashion since it would be holding some weight. I also decided to hang them in a diagonal fashion so the scarfs would fall between each hook. Next step is to one day paint the racks but for right now they will stay the natural wood.